Creating and organizing your personal space is what I’m most passionate about. I’ve studied how to design and how to use colors, textures and the desires of my clients to deliver projects that delight. Together we can create spatial environments that are as unique as the people who live and move throughout them. My clients come from all walks of life and often without a clear direction of where they'd like to go with the decor of their home. By collaborating with me, I’m able to take ideas that emerge and turn them into real designs. The result are homes, offices or work areas which maximize space and make people feel good knowing they’re in a ’special place’ …yours. smart durable design, clean lines, modern sensibilities and rustic elements Jess Cooney Interiors is a full service interior design firm specializing in home renovation, project management and home furnishings. We incorporate eco friendly products and focus on smart designs for busy families. Our signature is warm, clean lined spaces that reflect our clients interests, their needs and Berkshire living at it’s best. Interior design firm specializing in fresh spaces and functional living. As a former lawyer, Jeanne brings a methodical, problem-solving approach to every design dilemma. We believe living in your home should be easy - so no fussy, frou-frou design here. Just clean lines, loads of light, and a touch of the unexpected. Michelle Miller Interiors specializes in premium, full-service projects. As a professional in the home design industry for more than a decade, Michelle Miller’s holistic approach to interior décor is at once enchanting and accessible. Clients seek out Michelle not only for her refined yet practical touch but also for her willingness to listen and her innate ability to bring rooms to life by capturing the spirit and sensibilities of those who live in them. “I love the process of creating a home with people; not for them,” she has said. Contact us for your next project! “Love where you live!” Reed & Acanthus Interior Design creates sophisticated, functional spaces reflecting the design philosophy that one’s home should be an oasis in which to live, relax and entertain, all the while incorporating the personality of the owner. Single Room Design or clients in the beginning phase of Decorating $10,000-$50,000. 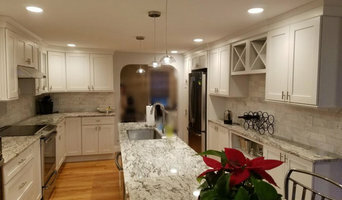 Kitchen Renovation $50,000-$500,000. Large Residence in need of Full Scale Design and Decorating $300,000 and up. Full in Depth Home Consults $250-$500. Custom Window Treatment $2500-$50,000. Custom Furniture $10,000-100,000. Reed & Acanthus bills on an hourly design fee basis tailored to fit client's scope and budget. Keeping in mind client’s taste, budget and lifestyle, Reed & Acanthus uses a minimalist approach, layering textures and fabrics in combination with contemporary and traditional furnishings to create comfortable, timeless and stylish spaces in a broad range of styles from summer house casual to gracious, formal homes. Katharine Kelly Rhudy worked at Sotheby's New York. A graduate of Columbia University, she obtained an M.A. in the History of Decorative Arts from Cooper Hewitt/ Parsons, pursued Appraisal Studies at NYU and studied Interior Design at Fairfield University. 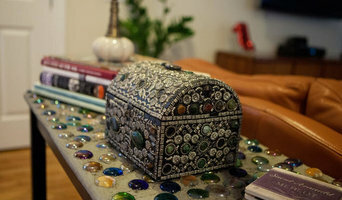 She is an associate member of the Interior Design Society and allied member of American Society of Interior Designers. Patti Stern, PJ & Co principal, decorator and stager started the company in 2005 with a passion for interior decorating. She developed a talented team of designers and accredited stagers to help clients create their vision for their home. We pride ourselves in making the decorating process pleasant and easy for clients with busy lifestyles. Whether it’s a consultation to select the right paint color or fabric for a room, complete decorating renovations, kitchen and bath cabinet and counter top selections, choosing the best coordinating backsplash, lighting, flooring, or furniture and accessory selections/arrangements, we collaborate with you to fulfill your personal goals and make you happy every step of the way. In addition, our team offers turnkey full-service home staging services to transform your home to sell quickly and for top dollar in today’s competitive real estate market. We work with homeowners and realtors to stage both owner occupied as well as vacant properties including new construction homes to target today’s sophisticated buyers looking for a move-in ready property. We are very proud of receiving the Houzz Best of Customer Service Award for 4 years in a row. Patti has shared her professional expertise in a variety of news media including Connecticut Magazine, the Hartford Courant, NBC Connecticut and FOX CT Television. She is also a regular contributor to the National Association of Realtor's Blog, "Style, Staged and Sold." BEST OF HOUZZ AWARD 6 YEARS IN A ROW! APK Designs is an Interior Design firm specializing in Hospitality, Residential and Corporate Design. Our main focus is to help our clients realize their vision one project at a time. At APK Designs we understand the importance of turning every space into our client’s dream. Therefore, regardless of the project size, we always work closely with our clients and strive to turn their vision into a reality. Agni Pavlidou Kyprianou is a registered Interior Designer and the owner of APK Designs LLC. A native of Cyprus, Agni holds a BFA in Interior Architecture and Design from the Academy of Art University. Having earned her NCIDQ accreditation she currently works as both a Commercial and Residential Interior Designer serving Newtown CT, Fairfield County, Westchester County, the greater New York area and Cyprus. Her international flare incorporates styles such as Minimalist, Exotic and Transitional. She prefers soothing interiors with harmonious color schemes. Her designs are often inspired from nature and she likes to incorporate natural materials whenever she can. Her Residential Design expertise range from complete House Remodels to Kitchen & Bath Design, Ceiling & Lighting Design, Custom Furniture Design, Home Staging, Decorating and Color Consultations. Her Commercial Design portfolio includes the design of lobbies, bars, restaurants, spas as well as corporate and medical offices. Agni also does freelance work for Architecture and Construction firms by assisting in the interior design of large Hospitality projects, such as Casino Resorts and Hotels. Worldwide Residential and Specialty commercial interior design firm. Our style is to work with respect and love for who you are, as we bring great interior design into the mix. Your space should enhance your life experience, and we make the process easy and fun! Our services include all phases of interior design, implementation of the design, follow through with every detail and a lifetime relationship to help you as your design needs change over time. Now we have so many vehicles to enhance, help and clarify your design experience. Examples are tools such as: a virtual walk-through of your home before it is even built, renderings in a variety of options, drafting and full visualization tools. We have access to and relationships with the best custom artisans from around the world making every dream a reality for our clients. We have offices in New York City (212-560-0355), Connecticut (860-233-4244) and The Berkshires (877-807-4244) Worldwide at any of the phone numbers. Alexis Parent (formerly Alexis Avellanet Design Services) has returned to running her own full-service design firm after working on high-profile projects for the corporate division of Lillian August. Her modern aesthetic can be seen in the clean and sophisticated yet inviting and livable designs she has created for HGTV productions and private residences and staging projects. Based in Fairfield, Alexis Parent projects are focused in the New York City area, with a specialty in relocation services for families moving to Westchester and Fairfield Counties. With a warm personality and professional approach, Alexis ensures a fun and worry free project. Voted one of the Top 10 Interior Design firms in CT by Design Build, All About Interiors is a full service interior design and custom window treatment company. With over 17 years of experience, Melanie Langford has established herself as one of the premiere interior designers in Connecticut. Melanie will help you create timeless, client-specific design solutions – a reflection of her profound dedication to all things beautiful, comfortable and functional. AAI offers a wide variety of services to meet every client’s needs and budget whether large or small. Affordable, hourly consultations for color, lighting, accessorizing and space planning are offered, as well as a wide range of Full Interior Design Services. 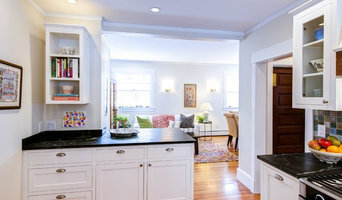 All About Interiors, located in Hartford County, servicing the entire state of Connecticut . For more information, project photos and to see what clients are saying, we invite you to explore the website and contact us for a free phone consultation. A good home design professional will hone your style down to its very essence and be able to choose a functional layout that feels natural to you. Interior design companies can be involved as much or as little as the client desires. Many clients who hire an interior decorator in Windsor, CT — particularly those who are remodeling — have a good sense of how the room should look and what products they should use. Often clients will insist that interior decorators use the products already present in the house. Other times a designer will need to start from scratch — especially if this is a newly purchased or just-built home. An interior design company will need to figure out exactly what the client needs, which includes organizing rooms, picking flooring and wall colors, and finding furniture to complement it all. Sometimes that means he or she will have to recruit help from other Windsor, CT home professionals to help create the perfect look for your renovation. Here are some related professionals and vendors to complement the work of interior designers & decorators: Architects & Building Designers, General Contractors, Home Builders, Design-Build Firms, Photographers. Do your research before meeting with an interior designer or home decorator in Windsor, CT. Ask yourself what you want your space to become and what it will be used for. Figure out the extent of what you need help with, what your must-haves are and what your budget is. Interior design services can add up fast, so be up front with a potential design firm or individual from the beginning. Also, pick an interior decorator that fits your style. Browse through the portfolios of different Windsor interior design firms and decide if you would live in those houses. Just because you like something doesn’t mean you could live in it. There's a big difference! Find an interior designer or home decorator in Windsor, CT on Houzz. Narrow your search in the Professionals section to find Windsor interior designers near you. You can also look through Windsor, CT photos to find a room you like, then contact the design firm who designed it.